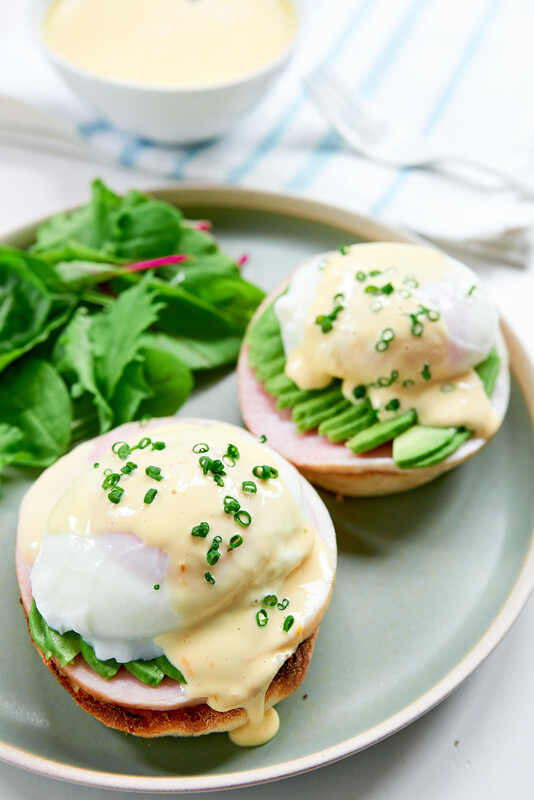 With luscious poached eggs perched on a bed of creamy avocado, savory ham, and crusty English Muffins before being blanketed in a silky smooth hollandaise sauce, these Eggs Benedict are the perfect idea for a lazy Sunday brunch. Maybe it’s my Asian DNA, but I like my breakfasts savory, rather than sweet. Eating a syrup-drenched pancake for my first meal just doesn’t have the same appeal as a plate of bacon and eggs, or a proper English fry up. But even amongst the plethora of savory Western breakfast choices, Eggs Benedict is my very favorite. When prepared properly, each dreamy bite is like noshing on a small mouthful of heaven. 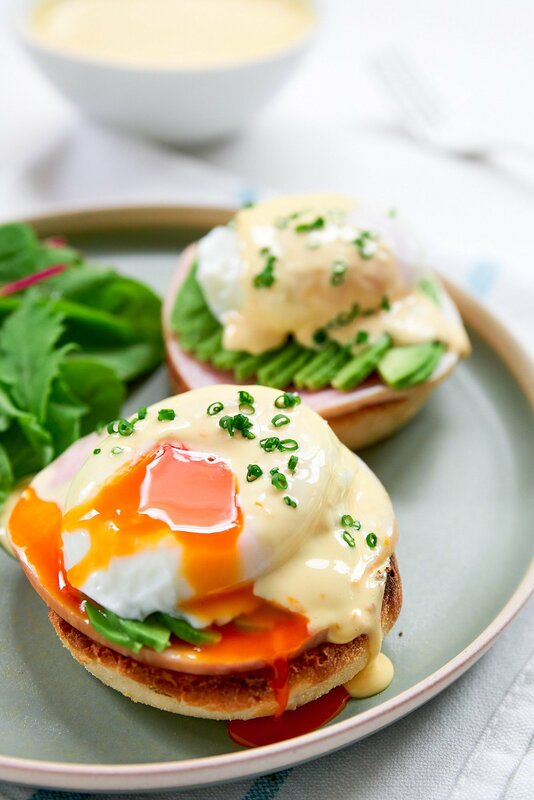 From the moment you sink a fork into the poached egg, and the pastel hues give way to the luscious orange yolk, to the final swipe of crusty English muffin through a pool of hollandaise, Eggs Benedict provides a parade of colors, flavors, textures and tastes that are a literal feast for your senses. Before you know it, you’re staring down at an empty white plate with a few golden streaks of yolk, punctuated by a scattering of crumbs. Although it’s not difficult to make, pulling off the perfect Eggs Benedict requires does require some precision and attention to detail, which why I’m splitting this post up so I can give each piece it’s due explanation. First head over to PBS Food and check out my tutorial on poaching the perfect egg. Next comes the Hollandaise sauce, which is often the most daunting component. Luckily, I have a Hollandaise sauce recipe that updates the classic method with modern tools and ingredients to make it easy and fool-proof. After conquering the poached egg and the hollandaise sauce, the rest may seem like a piece of cake, but each component requires the same care and attention. 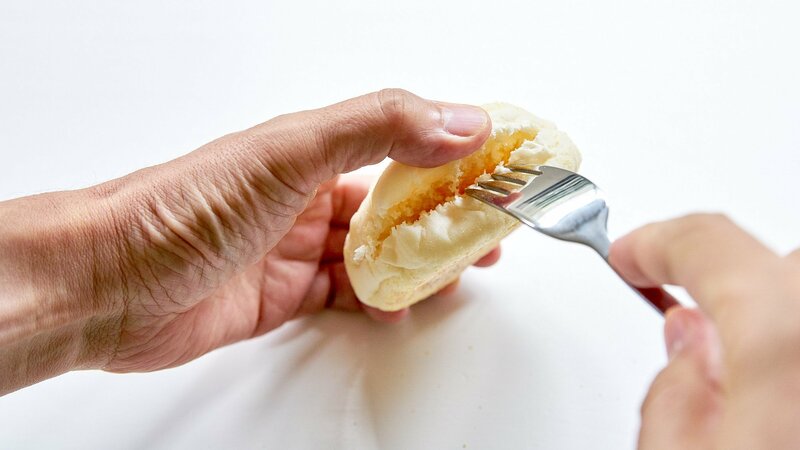 The English Muffin should be separated with the tines of a fork rather than sliced with a knife. This forms a craggy surface that allows the muffin to take color and crisp at its peaks while remaining soft and chewy in the valleys. For the protein, I like to use a thick cut ham, which I gently reheated for a few seconds in the water used to poach the eggs in. This not only avoids dirtying another pan, but it also keeps the ham tender and moist. 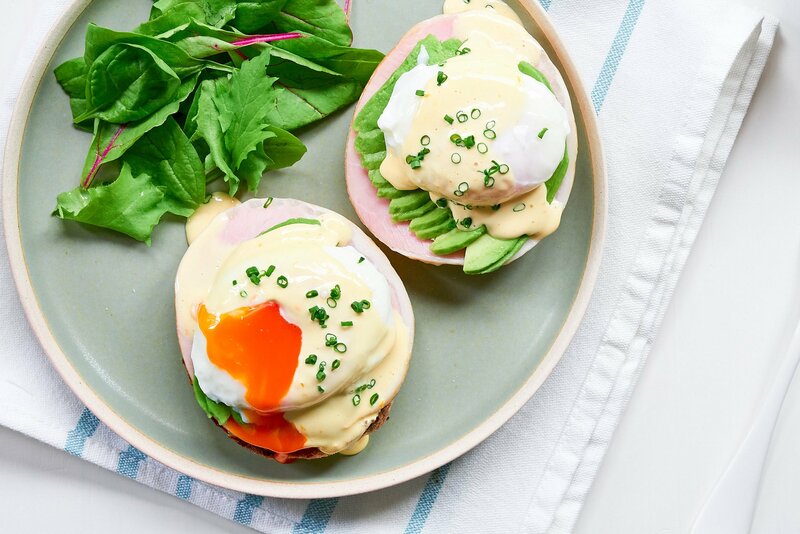 Finally, I like to add a layer of avocado in my Eggs Benedict, which creates a beautiful contrast of color while complimenting the creamy yolk and hollandaise sauce. The most important part of making Eggs Benedict is the timing. In an ideal world, all the components should be done right around the same time. I usually put a pot of water on while I get all of the components prepped (bread toasted, avocado sliced, hollandaise ingredients ready, etc.). Then, as soon as I lower the eggs into the water, I make the hollandaise sauce. The eggs should be done around the same time as the sauce. The only piece left is the heat the ham, which can be done as you assemble. If you’re a newbie, you can make the hollandaise sauce first and then keep it warm in a bowl set over a pan of warm water. Make a batch of Perfect Hollandaise Sauce. Poke the tines of a fork into the sides of the English muffins, working your way all the way around the muffin to split them in half. Toast until lightly browned. 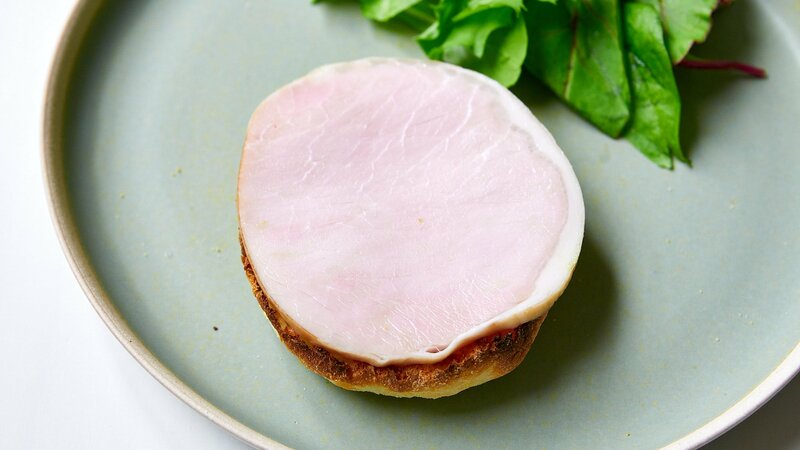 Heat the ham by briefly dipping it in the hot water you used to poach your eggs. 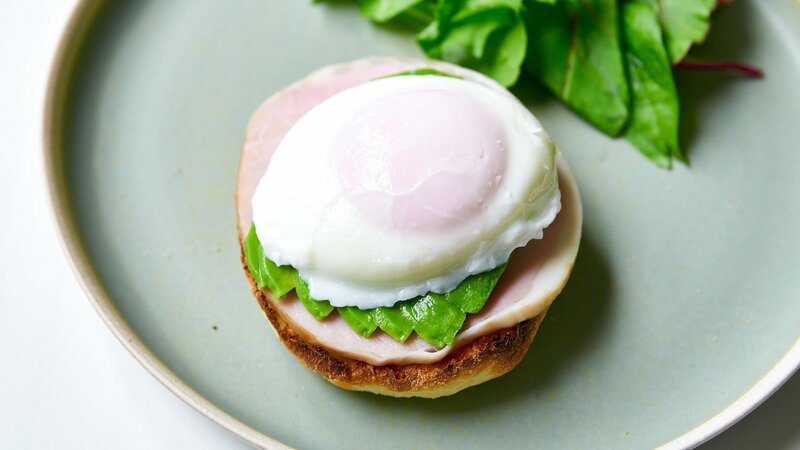 To assemble your Eggs Benedict, top a slice of toasted English muffin with a slice of warmed ham. 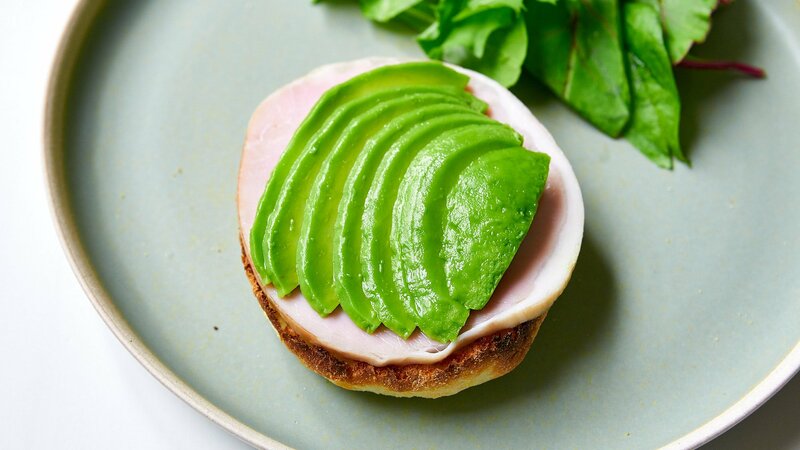 Fan out some avocado on top of the ham. Finish your Eggs Benedict with a generous blanket of Hollandaise sauce. Garnish with chives and serve immediately. Those are some pretty picture-perfect eggs! A good vacuum thermos works great for holding hollandaise sauce at temperature. Waking up on a Sunday morning to this post & no ham or english muffins in the house. Arrrrggghhh!!! Oh man, nothing starts a day off better than Eggs Benedict. The eggs you used look fantastic- such bright orange yolks! Hahaha, I do make a pretty mean loco moco. I start with some garlic fried rice topped with these patties: http://norecipes.com/blog/hamburg-steak-hambagu/ . Covered in a dark gravy made from beef stock and demi-glace. Then I top it off a with a sunny side up that’s crispy around the edges and bottom. Perhaps I’ll post some day. Sigh this is foodporn at its best! It’s the perfect breakfast isn’t it? That’s the color of eggs in most parts of the world (these were from Japan). I’ve heard the color comes from feeding chickens red peppers. Benedict too! It looks absolutely delicious. I thought this recipe is one of dairy free recipes but it does has butter? 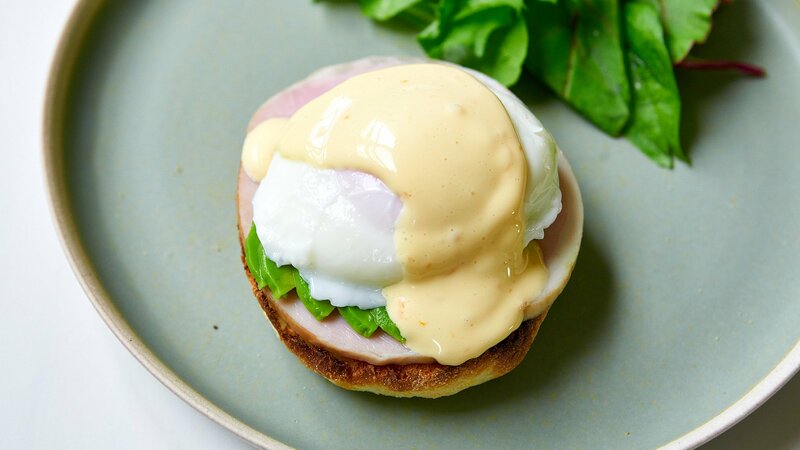 There’s a blender Hollandaise sauce recipe that is super delicious and super easy. It’s genius really. You place the egg yolks, lemon zest and juice, salt, and any optional herbs in a blender, then you whir it up for a minute, then you drizzle in the hot melted butter while the blender is running. Voila! Awesomely easy Hollandaise! I like my ham thick cut too…mmmm! Just wondering how you get around using raw eggs with this technique? Not a good idea at all, n’est pas? yes it does. And lots of it. Why does it call ofr four eggs? One for each muffin and then one for the yolk. What is the last egg for? Hi Orangeorphan, since the english muffins are sliced in half this makes 4 eggs benedict. That’s why there are 4 eggs and 4 slices of ham.